When you love working with your brushes, it feels great to do a 10 m2 mural with brushes size 12 mm.! 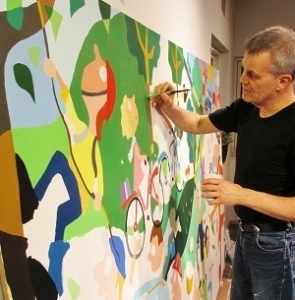 Ole Grøn has done murals for companies, schools, institutions etc. Often he begins his work with meeting people, who work or live there, to gather inspiration and feel the atmosphere of the room.